More or less paperless? There’s a middle way! It has been fascinating to watch the flurry of activity on Twitter since the new year concerning an industry initiative, ‘Paperless 2013’, led by GoogleDrive and other digital companies. The idea is that people can sign up to resolve to make this a ‘paperless’ year, presumably by adopting the technologies on offer from the various companies involved, who promise to take the ‘paper’ out of ‘paperwork’. Part of the plan was for people to pledge their support using the Twitter hashtag #paperless2013. A backlash from the print industry followed pretty swiftly on its heels.Â There was an attempt at ‘hashtag takeover’,Â whereby print-industry people were encouraged to use the hashtag to promoteÂ paper products and services and argue the virtues of paper. A brief twitter-storm followed, the print industry claiming more people were using the hashtag than those committing to going paper free. Two Sides, the print industry promotion vehicle wrote an open letter to Google accusing them of Greenwash. To those of us in civil society committed to trying to find pathways to a truly sustainable future of paper production and consumption, it has been educational to watch this very uncivil dog fight between two parts of the communications industry. We would like to suggest a middle way. It has seemed clear to us, for years now, since we wrote in our Common Vision for Transforming the Paper Industry in 2006, that we don’t need to use more paper, and we don’t need to use no paper at all. We need to use half as much paper as we do now. That’s what our paper reduction project, Shrink Paper, encourages. 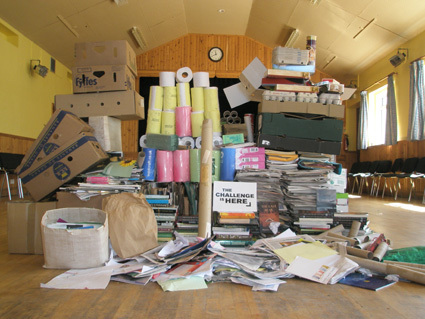 Perhaps if they renamed the campaign ‘Less Paper’ instead of ‘Paperless’Â it might all have been a bit friendlier. So, here’s to #lesspaper2013 !